CHC Realty Capital Corp. (CHC-X) has added another student housing property to its portfolio, this time acquiring a former Sudbury office space repurposed as student housing. The Toronto company began trading on the Toronto stock exchange (CHC.X) in January becoming Canada’s first public company focused on student housing (Property Biz Canada, March 27, 2014). The 28,965-square-foot, six-storey office building, purchased for $5.5 million is located at 50 Lisgar St. in the city’s downtown. The building includes 70 beds in 50 student apartments, along with 4,500 sq. 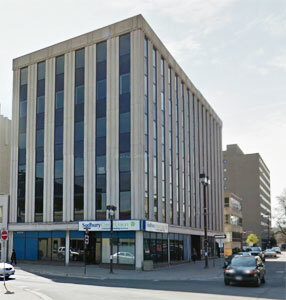 ft. of main floor commercial space (Image 0f 50 Lisgar from Google street view). Constructed in 1970 as an office building, the structure had been repurposed in 2013. Its location, less than 300 metres from LaurentianArchitectureLaurentienne and about five kilometres from Laurentian University’s main Sudbury campus, makes it ideal. Laurentian University is described as a bilingual, tricultural institution, offering English and French, as well as Aboriginal services for its more than 175 undergraduate and graduate programs. It is also home to the Northern Ontario School of Medicine. Besides the university, Sudbury is also home to Cambrian College, offering more than 90 full-time programs and more than 800 part-time programs, and the French-language Collège Boréal. Maureen Luoma, executive director of Downtown Sudbury, has said student housing is a natural fit with the planned development of the core with its arts and culture centre, dining, and music. “The student residential will help to support that, and we now have things that help to support student residents, with the grocery store, with transit right there, you’ve got those amenities that would be welcome for someone wanting to live downtown, so things are starting to match up nicely,” she told the Sudbury Star. The Sudbury acquisition is just the next step in CHC’s continued growth into student housing. Earlier this year, the company announced it had entered into an agreement to spend $2.5 million to acquire an 18-bed property called Liberty Terrace near Queen’s University in Kingston, that also included 1,108 sq. ft. of ground floor commercial space. In 2013, it acquired the two-building The Luxe in Waterloo, located near both Wilfred Laurier University and the University of Waterloo. Containing a total of 954 beds The Luxe’s furnished suites are complimented by a movie theatre, fitness and yoga studios and a games room. CHC’s West Village Suites in Hamilton is a 449-bed LEED-platinum certified residence within walking distance of McMaster University. Another property, the 558-bed Village Suites in Oshawa, is LEED Gold-certified and within walking distance of Durham College and the University of Ontario Institute of Technology. The company had said earlier that at an appropriate time it would consider conversion to a REIT, a move that would make CHC the first Canadian REIT catering to the demand for student housing.